Some call this section of the Youghiogheny River the ULTIMATE CHALLENGE. 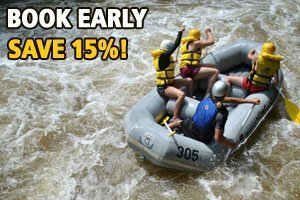 With the Miracle Mile dropping off over 115 feet per mile, you will be a part of the most exhilarating rafting experience available anywhere! Because of the challenging nature of this section of river, everyone participates in the adventure. Previous rafting experience is strongly recommended. We use specially designed self-bailing four-person rafts with foot stirrups to help you tackle the technical Class IV and V rapids. One guide and three guests are in each raft, with only our most experienced guides accompanying you on this tour. The Upper Yough can only be run on dam release. So be sure to check the release schedule listed below. Shuttle transportation and riverside lunch are included. We meet at our base in Ohiopyle and transport you to the put-in near Friendsville, MD. APRIL: The last two Fridays (4/19, 4/26). MAY: The first two Mondays (5/6, 5/13), the first three Fridays (5/3, 5/10, 5/17), first Saturday (5/4) and Memorial Day weekend Sunday (5/26) and Monday (5/27). JUNE: All Mondays, all Fridays, and the last two Saturdays (6/22, 6/29). JULY: All Mondays, all Fridays, and all Saturdays. AUGUST: All Mondays, all Fridays, and all Saturdays. SEPTEMBER: All Mondays, all Fridays, and the first two Saturdays (9/7, 9/14). OCTOBER: The first two Mondays (10/7, 10/14), first two Fridays (10/4, 10/11), and first Saturday (10/5). Please note that the listed prices are per person and do not include 6% amusement tax. The skill level of this tour is 4 on a scale of 1 to 4. You will experience Class IV and V rapids. This tour is for experienced rafters only. 16 is the minimum age of rafters on this tour. You will receive a picnic lunch at the river’s edge.